Our corrugated sheets are British standard 3" pitch with a profile depth of 3/4". They have an effective cover width of 990mm. 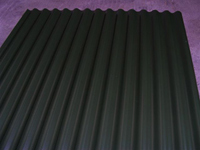 Our corrugated sheets are available galvanised, polyester painted or plastic coated.